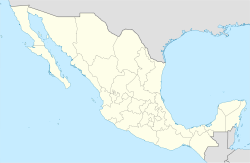 Celaya ( pronunciation (help·info)) is a city and its surrounding municipality in the state of Guanajuato, Mexico, located in the southeast quadrant of the state. It is the third most populous city in the state, with a 2005 census population of 310,413. The municipality for which the city serves as municipal seat, had a population of 415,869. The city is located in the geographic center of the municipality, which has an areal extent of 553.18 km² (213.58 sq mi) and includes many smaller outlying communities, the largest of which are San Miguel Octopan, Rincón de Tamayo and San Juan de la Vega. Celaya was a frontier region between the Purépecha and the Chichimecas. General Álvaro Obregón defeated Pancho Villa in the Battle of Celaya, 1915. Celaya was also the Guanajuato state capital for a short period. 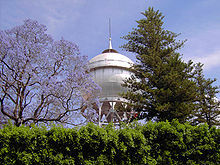 Celaya's main icon—a water tower in the heart of the city. '"This tower was built at the expense of the city municipality in 1910 and officially opened on 15 September, the day of the anniversary of the proclamation of the independence of Mexico as a state governor Mr. Don Joaquín González Obregón, who gave full moral support to the construction. 's work and everything related to the provision of drinking water, was designed and conducted by the district political head Mr. Don Perfecto I. Aranda, its total cost, including piping limited to two circuits, was $ 161,520.84 (mexican old) pesos ". The work was carried out under the command of German Enrique Schöndube, although it is known that payment for the construction took ten years due to the start of the Mexican Revolution, so it was paid once the new government established. During the Mexican Revolution, Villa's officers thought the hydraulic tower had such a large amount of water that destroying it would drown the population of Celaya. One of Villa's generals ordered his artillery to destroy it. Captain Gustavo Duron, in charge of a 75mm battery, followed the orders but shot around the tower, avoiding it and protecting the monument, as mentioned by local historian Herminio Martínez. The construction resulted in the neglect of the people handing out water at home from the mayor's office called water carriers. Commercial advertising on its surface was allowed for several years to cover the costs of the reservoir, ending on September 8, 1980 when, in celebration of upcoming 410th Anniversary of the Foundation of Celaya, the mayor in charge decreed that the Ball of Water would be a symbol that would represent the city, and the placement of advertisements was banned. Celaya is also famous for the artisanal production of cajeta, a type of milk candy. The Celaya Airport has (as of January 22, 2007) commercial flights to Santiago de Querétaro and connections from there to other destinations. Celaya lies along the El Paso Spur of the Pan-American Highway which is known locally as Mexican Federal Highway 45. Christian Tumalan (b. ), Band Leader of Grammy award winning Pacific Mambo Orchestra; classical pianist. José Francisco Ortega (b. 1734 – February 1798) was soldier and early settler of California. Miguel Martínez (b. September 29, 1921), Musician, composer and songwriter. Considered the father of the modern mariachi trumpet. Francisco Eduardo Tresguerras (b. October 13, 1759, d. August 3, 1833), Architect and painter. Designed the beautiful El Carmen church in Celaya. Raúl Velasco (b. April 24, 1933, d. November 26, 2006) Entertainer and TV Producer. Was the host of the popular marathonic TV program Siempre en Domingo. Octavio Ocampo (b. February 28, 1943) Painter famous for his "metamorphosis" style. Eliseo Ocampo Jaramillo (b. February 16, 1977) Coauthor of "Marketing Político e Imagen de Gobierno en Funciones"
Mauricio Ochmann (b. November 16, 1977), Actor. Ever Guzmán (b. March 15, 1988), footballer. Adela Patiño (b. February 11, 1965) also known as Adela Fernandez (La Gallera), Singer, Composer. Eric del Castillo (b. July 22, 1930) is a well-known Mexican actor. Juan Eduardo Pulido Macais (b. March 20, 1984), Ballet Dancer, who is currently dancing in Europe for Bejart Ballet. José Juan Vázquez (b. 14 March 1988), Mexican footballer, who currently plays in Club Leon. ^ NORMALES CLIMATOLÓGICAS 1971-2000 Archived 2013-02-19 at Archive.today, National Meteorological Service of Mexico. Retrieved August 4, 2012. ^ "Nuevo Continente Bajío: Contacto". nuevocontinentebajio.edu.mx. ^ "Colegio México Celaya – La Verdad Os Hará Libres". www.colegio-mexico.edu.mx. ^ "Escuela Guilford". 18 December 2007. Archived from the original on 18 December 2007. ^ "Instituto Hans Christian Andersen". www.institutoandersen.edu.mx. ^ "Wayback Machine". 22 July 2011. Archived from the original on 22 July 2011. ^ "Portal Web ITCelaya - Site". www.itc.mx. ^ "Instituto Tecnológico de Roque". 21 July 2008. Archived from the original on 21 July 2008. ^ "Inicio - Universidad de Celaya". www.udec.edu.mx. ^ "UNITESBA - Universidad". www.unitesba.edu.mx. ^ "Universidad Lasallista Benavente". www.ulsab.edu.mx. ^ "Universidad Latina de Mexico - Offline". 28 February 2010. Archived from the original on 28 February 2010. A casi 100 años de la Bola de Agua (Near the century of "Ball of Water"